Thank you for being our customer... 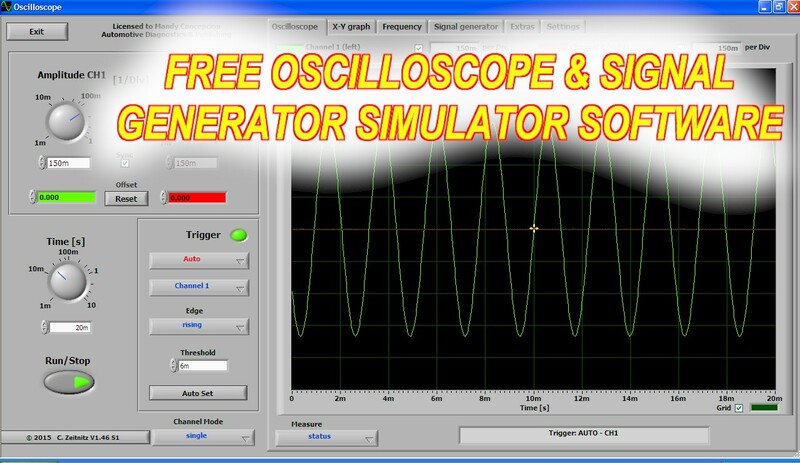 The FREE Oscilloscope and Signal Simulator Software is free to use for our customer base. Whether you've purchased a book, DVD, Software or Equipment product, you are entitled to this FREE software package. Another way to become a customer is to be on our E-mail list SUBSCRIPTION here. Just sign up and partake on our weekly "Automotive Repair and Diagnostics News", where we send you FREE class-lessons, software like this and more. NOTE: If you're a customer and want this FREE Oscilloscope and Signal Generator Software package just give us a call (Mandy) and let me know. I'll send you the link to it so you can learn from it. The FREE Oscilloscope and Signal Simulator Software is a unique scope that works with your PC-Laptop's sound card. It was developed specifically for us with an eye on automotive training. As such, it can simulate all sorts of automotive signals (with a little bit of know how). Future FREE lessons for our customers and E-mail list subscribers will concentrate on expanding the functionality of this great software. At the same time, various other "Signal Conditioning Equipment" has been developed to be used with the software. It is possible to convert this oscilloscope software into a full fledged engine analyzer and sensor signal simulator, with external circuitry/equipment. For now, you may get the software to your advantage free of charge. Enjoy. PS. Comments and questions are always welcome. We want to know what you like and need, so E-mail us or give us a call at the number above. Thanks...Mandy Concepcion.